los angeles | Nobody Move! On this date in 1997, LAPD officers patrolling North Hollywood saw two heavily armed masked men enter the Bank of America Branch on Laurel Canyon Blvd. Several minutes later the men left the bank with over $300,000 in cash. By that time, several other police units had arrived on the scene to provide backup. The robbers, Larry Phillips (above left) and Emil Matasareanu (above right) were ready for a confrontation with police; they were each carrying multiple weapons, had thousands of rounds of ammunition, and had taken phenobarbital prior to the robbery to calm their nerves. To make matters worse, they were both wearing body armor. The robbers opened fire on the officers. In the ensuing gun battle, which lasted over 40 minutes, officers fired over 600 rounds, the robbers over 1000. Over-matched by the robbers’ superior firepower, officers went to a local gun store to procure better weapons. The shootout ended with the death of both suspects. Ten officers and seven civilians were injured. You can see pictures from my 2008 trip to the scene here. 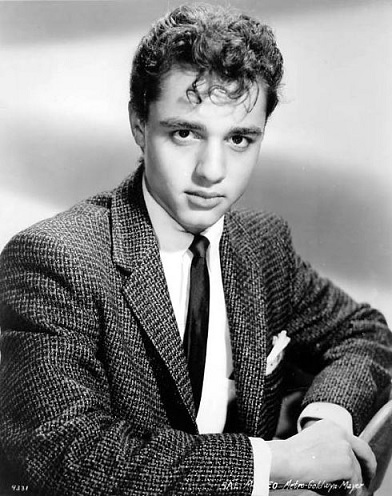 On this date in 1976, actor Sal Mineo was stabbed to death after parking his car in Los Angeles. Mineo, 37, had been nominated for two Academy Awards for Best Supporting Actor. He had just returned home from rehearsing a play when he was attacked. Police had little to go on, other than a vague description of the attacker given by witnesses who saw the man fleeing the seen. After two years of dead ends, detectives received a call from Michigan police about a man named Lionel Williams. Williams, who had been arrested on bad check charges, was heard bragging that he was the one who killed Mineo. An interview with Williams’s wife revealed that he came home covered in blood on the night of the murder. She also provided police with a description of a knife that belonged to Williams. Her description matched the cast of Mineo’s knife wound that was made by the coroner. Lionel Williams was tried and convicted of murder in 1979. He received a prison sentence and was paroled in 1990. On this date in 1947, the mutilated remains of a young woman were found in Los Angeles. The woman would soon be identified as Elizabeth Short, an unemployed 22 year old, originally from Massachusetts. 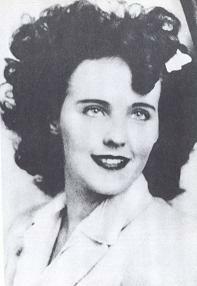 The news media would soon dub her the Black Dahlia. The LAPD conducted an exhaustive investigation, but the case remains unsolved. 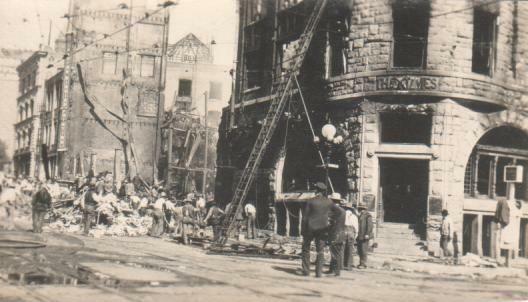 On this date in 1910, a bomb was detonated in an alley next to the Los Angeles Times building in Los Angeles, CA. The bomb, which was planted by labor union activists who were angry at the paper’s anti-union editorial policies, was set to go off when the building was empty. A faulty timer resulted in an early detonation. A faulty placement of the device–right over a gas line–resulted in a fire that ultimately destroyed the entire building, and the building next door. In all, 21 people were killed. The police investigation of the bombing quickly hit a dead, leading city officials to hire private investigator William J. Burns to track down the guilty parties. Burns, who was already investigating other bombings believed to be union-related, incorporated the case into his ongoing investigation. Based on information from spies that Burns had planted in the unions, as well as eyewitness testimony, Burns identified the guilty parties as brothers J.B. and J.J. McNamara, and Ortie McManigal, who were all labor union officials. In April 1911, McManigal and J.B. McNamara were arrested in a hotel in Detroit. They were found in possession of suitcases that contained blasting caps, dynamite, and alarm clocks. After a grueling (and probably unconstitutional) interrogation, Burns got McManigal to agree to turn state’s evidence. A warrant was obtained for the arrest of J.J. McNamara. He was arrested several days later at an executive board meeting of the Iron Workers Union. National labor leaders condemned the arrests as a frame job. The union tried to hire famed defense attorney Clarence Darrow to defend the men. Darrow initially declined due to his failing health, but was eventually convinced to take the case by labor organizer Samuel Gompers. Darrow quickly realized that the police had a fair amount of evidence against the McNamaras, including the testimony of McManigal, who was not being charged in the case. He eventually convinced the brothers to plead guilty in order to avoid death sentences. J.B. McNamara was sentenced to life in prison. J.J. McNamara got 15 years. J.B. died in prison in March 1941. Upon his release, J.J. went back to work for the Iron Workers Union as an organizer. He died in Butte, MT, two months after his brother’s death. On this date in 1985, police in Los Angeles, CA broke up a mob that was beating a man they had detained. 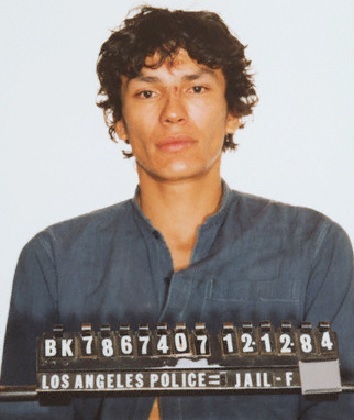 The man was Richard Ramirez, better known as the Night Stalker. The crowd had recognized him from a mugshot that had recently been shown on TV. The LAPD had identified Ramirez as the prime suspect in over a dozen murders, as well as attempted murders, sexual assaults, and burglaries. Ramirez was tried and convicted of 13 murders, 5 attempted murders, 11 sexual assaults, and 14 burglaries. He was sentenced to death. Richard Ramirez died of cancer while awaiting execution. He was 53 years old and had been on death row for 23 years. In a strange twist, Ramirez was captured on the 97th anniversary of the murder of Mary Ann Nichols, the first of the canonical five victim’s of Jack the Ripper’s. 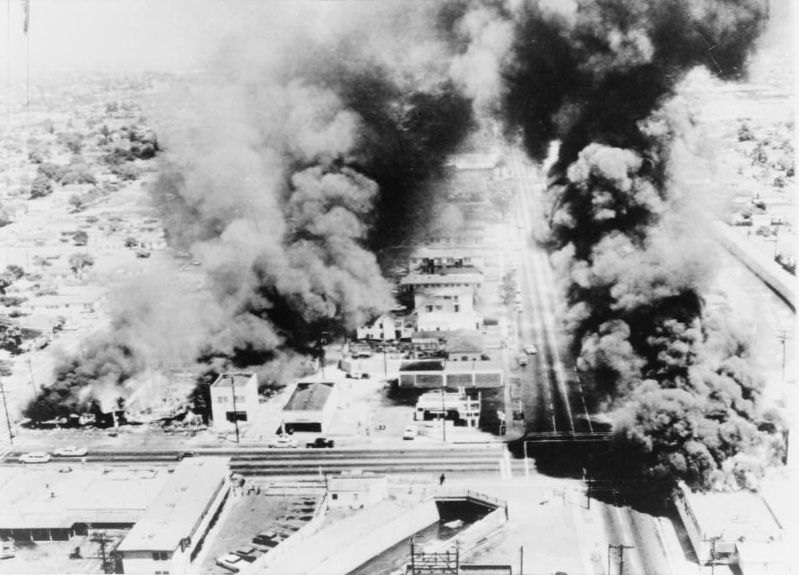 On this date in 1965, a minor scuffle following a traffic stop in Los Angeles would escalate into what would become known as the Watts riots. The unrest would continue until August 17th. When it was all over, 34 people were killed, over 1000 injured, and 3400 arrested. Almost a thousand buildings, mostly businesses, were damaged or destroyed. Damage was estimated to be about $40 million. On this date in 1969, members of Charles Manson’s “family” murdered five people at the Los Angeles home of actress Sharon Tate. The victims included Tate (who was eight months pregnant), hair stylist Jay Sebring, coffee heiress Abigail Folger, Polish actor/writer Wojciech Frykowski, and recent high school graduate Steven Parent. Three of the victims were friends of Tate and her husband, director Roman Polanski. Polanski was in Europe filming a movie at the time of the murders. The fifth victim, Steven Parent, had the misfortune of visiting the home’s caretaker (who was staying in an adjacent cottage) on the night of the murder. He was intercepted by the Mansonites as he was leaving the property. The victims were all shot and/or stabbed by Manson followers Charles “Tex” Watson, Susan Watkins, and Patricia Krenwinkle while Linda Kasabian stood watch. After the murders, Atkins wrote “pig” on the front door of the house using Sharon Tate’s blood. The following night, the four killers, along with two other Manson followers, Leslie Van Houten and Steve “Clem” Grogan, would murder Leno and Rosemary LaBianca. Manson would actually accompany the murderers to the scene this time, but left the dirty work to his minions. When police finally caught up to Manson and his crew, they convinced Linda Kasabian, who hadn’t actually committed any of the murders, to testify against the other members of the family. All of the defendants were ultimately convicted. They are all currently incarcerated in California, except for Grogan, who was paroled in 1985, and Atkins, who died in prison in 2009. Linda Kasabian returned to her native New Hampshire after the trial.